Let’s be real… Sometimes we’re absolutely living for the amazing costumes and accessories you girls show up in for your Hens Treasure Hunt. We love you girls sooo much that we decided to put together a list of all the hens night accessories out there right now. Whether your DIY-ing (clever chickens), online shopping, or out and about… it’s great to get a feel for what’s out there, and what will suit your group! This is pretty huge right now. 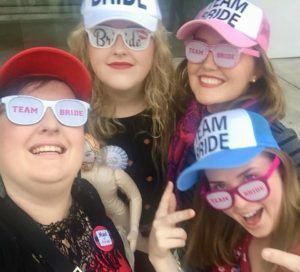 There are sunnies, caps, tank tops, tattoos… you name it, it’s got ‘TEAM BRIDE’ plastered on it. And we love it. There are so many to choose from. Some super floral, some a little more cutesy, some more of a headband situation. Whatever you choose, it’s bound to look adorable without stealing the thunder of your ‘proper’ wedding day veil. Admit it. We all kind of want to feel like we’re exclusive backstage VIPs. Time to make it a reality. There are tonnes of options online – grab one for all the girls. They’ve been around for forever, and looks like they’re here to say. Grab one for the bride-to-be, the maid of honour, the bridesmaids… or y’know, everyone! These customisable and cute little mementos have just recently sprung up again but are proving super popular. Cost-effective, yet adorable and an awesome little keepsake. Come across any other awesome accessories? Drop us a line!